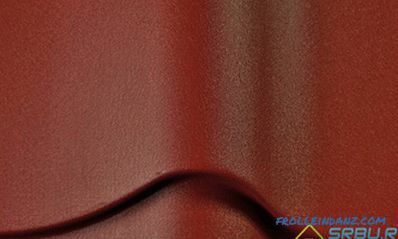 There are two very popular roofing made of steel profiled sheets. One of them is cheaper, the other is more expensive, and they both serve from 20 to 60 years (depending on the manufacturer). It seems that everyone already knows what they are talking about. Now it remains to find out what is better - metal or corrugated, and for what purposes each of the coatings is more suitable. It is called differently: professional sheet, corrugated, and even profile This material, invented in England in 1820, was made from cold-rolled roofing steel. Each of its sheets is given a wavy, rectangular or trapezoidal shape. To achieve strength, steel is zinc coated or coated with aluzinc. 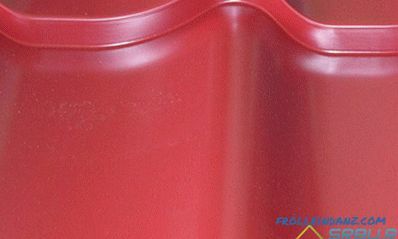 A polymer coating can also be applied on top, which improves the properties of the material. Wall sheeting is used to make fences and wall claddings. Corrugated roofing (no more than a millimeter thick) is used to organize the roof. Universal decking is used for wall cladding and roofing. This is possible due to the well-chosen shape and size of the ribs of the profile. For its production, as in the previous case, cold-rolled steel is taken, which is subjected to profiling. Only its thickness is less than that of profiled sheeting, and the profile picture is somewhat different. After all, the difference between metal tiles from corrugated board is that the first one is designed to imitate natural ceramic tiles. And so it has a similar pattern. In addition, metal is available with a wide variety of polymeric coatings that perform a protective function. 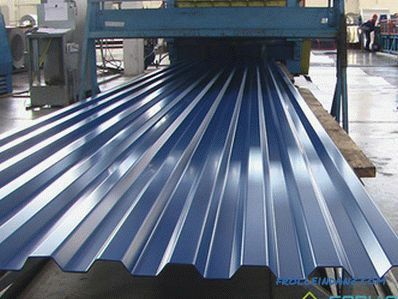 The steel used for the production of corrugated board is thicker (from 0 5 to 1.2 mm). A metal tile is made of steel sheets from 0.4 to 0.6 mm thick. But it has several layers of coating, and if it is them that are taken into account, it still surpasses the professional sheet in thickness. But metal sheeting is usually thicker, therefore the weight of the professional sheet is somewhat more substantial - 3.6–11 kg per square meter. In metal, this figure is 3.8-7 kg. We give specific examples of taking popular brands. 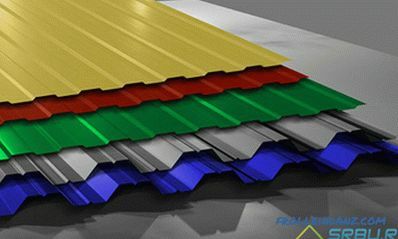 Structure of a sheet of metal tile and roofing sheeting. The Monterrey metal tile has a weight of 4.5 to 5 kg per square meter and a thickness of 0.4 to 0.5 mm. The HC20B profiled sheet weighs from 4.9 to 8.4 kg per square meter (thickness 0.45-0.8 mm). 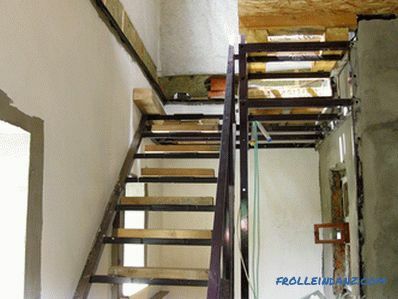 As you can see, none of the materials can be called particularly heavy - they do not require a reinforced truss system. However, increasing the thickness of the sheet even by one-tenth of a millimeter can sometimes add a few years of life to the roof. First a layer of zinc or aluzinc is applied on the professional sheet (the latter gives greater strength). Aluzinc material is the brainchild of Arcelor. It contains aluminum (55 percent) and silicon (1.6 percent) in zinc. This coating is slightly less plastic than just zinc, but it is difficult to scratch it. From above the professional flooring is covered with a passivating and priming layer, as well as with an additional polymer coating. If you cut across a sheet of metal tile, you can also see many layers of coatings. First, galvanized on both sides, then an aluminum passivating film that can additionally protect against corrosion. Then, without fail, there is a primer and a polymer layer, fixed with varnish. There are many types of polymer coatings for metal tile as well as for professional flooring. 1. 25 microns - polyester layer. The appearance of the coating is polyester. 2. 35 microns - a layer of opaque polyester (Teflon is added). The appearance of the coating is matte polyester. The appearance of the coating is Pural. The appearance of the coating is plastisol. 5. 300 microns - PVDF layer (the most resistant to ultraviolet). The appearance of the coating is PVDF. This is influenced by several factors. First we take into account what is in sight - the polymer layer. 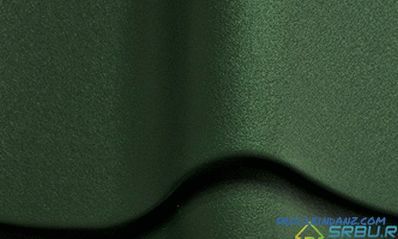 It increases the service life of the material by 10 years.Thus, the metal tile having such covering will serve longer, than the galvanized professional flooring, such not having. If you compare the decking with a polymer coating and metal tile, then everything will depend on the type of polymer coating. 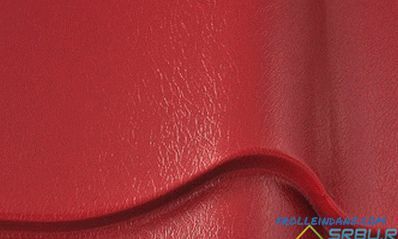 The most durable (60-70 years) is considered a plastisol coating, and the polyurethane is 30-40 years. Now about the quality of galvanized steel. If zinc on it is not more than 140 grams per square meter, then it will serve 10 years less than that with zinc - 245 grams per square meter. By the way, unlike European ones, Russian producers sometimes save zinc. Do not forget about the thickness of the steel sheet. 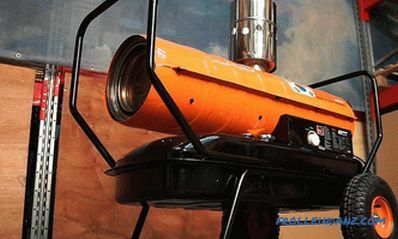 One tenth of a millimeter added to it can increase the service life of the material by 5 years. Therefore, thicker grades of corrugated can often have a longer service life than metal tile from thin steel. In general, both materials are quite durable. Metal roofing has an average service life of 20-40 years. The professional flooring is 30-45 years old. But when buying, it is imperative to consider the reliability of the manufacturer And after all, some Chinese products do not always shine with quality. The profile of corrugated can be wavy rounded, and also have the shape of a trapezium or rectangle. 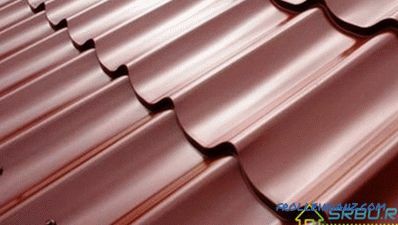 The metal tile is produced in the form of sheets with a width of 1.16 to 1.18 meters, and a length of 0.4 to 6 meters. Height the profile varies from 22 to 25 cm. Drawing on sheets of metal is more complex than that of corrugated flooring - it is as close as possible to real tile laid out in rows. It should be remembered that metal tiles can lose shape from high temperatures, so it is better not to buy very long sheets of it. wave step - 350-400 mm. Now about the installation. It is easier to produce it with a professional flooring - because compared to a metal tile, this material is much easier to pick up under a certain slope of the roof. In view of the simplicity of his profile, it is much easier to perform his roofing work. 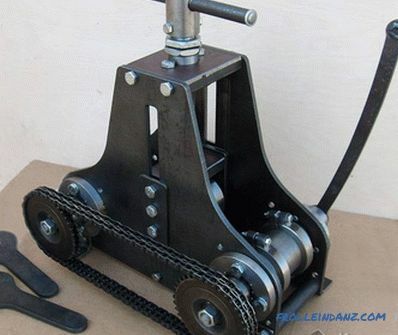 And vertical measurements will not be needed, and trim parts will be less difficult, and waterproofing will be better. Note that long professional sheets roof is much faster. But they are very long and heavy, and one cannot cope with such a sheet. For such work a team of experienced craftsmen is needed. A metal tile has a comfortable size, and put it under force alone. No one or the other material is able to burn completely and will not be able to sustain burning - because they have metal in the middle . Both of these roof coverings require additional protection from external noise. Otherwise, tarahtenie rain on the roof will act on the nerves. Good thermal insulation will help not only to keep warm, but also to muffle unwanted noise. One of the budget options for heat insulators is mineral wool. Metal tile and here the first - it looks much more interesting than a uniform professional sheet. Particularly nice look angular roof, which was used in the design of metal. A variety of types of this material allows you to arrange a house in any style. Profile variations of roofing corrugated board. Glossy, matte or metallized coating and a variety of the profile itself open up a lot of opportunities for imagination. Decking that is simpler in construction is significantly cheaper than metal tile. 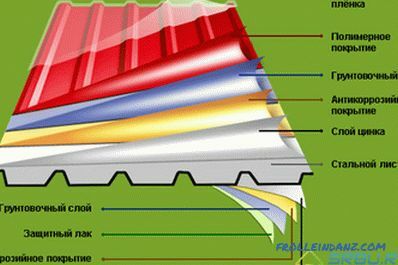 For example, a roofing corrugated with a thickness of 0.5-0.55 mm has a price for one square meter from 100 to 200 rubles. Metal tile of the same thickness, costs from 300 to 400 rubles per square meter. 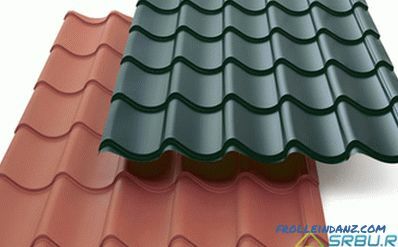 In addition, when roofing a complex-shaped roof, metal tile gives inadmissibly a lot of waste. They can be from 5 to 40 percent! 1. If the slopes of your roof have a slope of less than 12-14 degrees (or it is completely flat), then take a professional flooring. 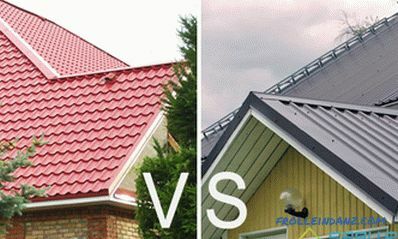 After all, it has no lower limit on this parameter, but metal roofing under such conditions cannot be used. 2. Professional sheet is used also in cases when reliability and low price are the most important, and not appearance. Additional stiffeners due to the geometry of the profile allow you to build a very strong roof. For example, it is quite reasonable to build farm buildings like a shed and a garage with professional flooring. 3. If, however, design and beautiful design come to the fore, and there are no particular restrictions on finances, choose metal tile. A house with such a roof will look very presentable.